The way things are shaping up down south (viewed from Belgrade) the tiny, helpless, beleaguered new Balkan state of Macedonia could be the trigger for a wider regional conflict. It is well to remember the adage of veteran politician Franklin Delano Roosevelt, especially in the present context: If it turned out a certain way, it is probably because that is the way it was planned. If the stage is indeed being set for a new Balkan conflagration, many signs suggest that Macedonia has been assigned a key role in the process leading up to it. Slightly under two years ago, Guaido’s Balkan precursor, Zoran Zaev, was promoted by non-Macedonian interests to unconstitutionally replace the less compliant but democratically elected long-time stooge Nikola Gruevski as prime minister. Procedural niceties were brutally cast aside when Macedonia’s Western masters concluded that Gruevski was getting too many independent policy ideas and that letting him remain in office was therefore risky. In a ruthless, Kiev 2014-style coup, coordinated from the embassies of all the usual suspects, Gruevski was unceremoniously ousted. (By a remarkable coincidence, ambassador Jeffrey Pyatt, of Kiev fame, is now accredited to the neighboring Greek government and undoubtedly supervises these affairs from his Athens command post.) Usurper Zaev was promptly installed, though lacking the required parliamentary majority and in disregard of president Djordje Ivanov’s strong initial refusal to officially appoint him. But that did not matter in Armenia, why should it now in Macedonia? The masters’ game plan was soon revealed. One objective was to make sure that the Russian pipeline’s passage through strategically located Macedonia would be permanently blocked with the cooperation of a reliable lackey. The other items on the agenda consisted of (1) rearranging the internal political balance of power to overtly favor the aggressive and Western-supported Albanian minority, laying the foundations for Macedonia’s violent Yugoslav-style, ethnically driven breakup at some point, and (2) getting Macedonia into NATO and shoring up NATO’s southern front by “settling” the name dispute with Greece, also to be accomplished to Macedonia’s disadvantage. Zaev’s first order of business was to implement the so-called “Tirana platform,” an agreement he reached with Macedonia’s Albanian minority while still a private citizen. (He is obviously lucky that Macedonia does not have anything like the Logan Act.) Significantly, the agreement involving the de facto federalization of the tiny country and the granting of extensive privileges to a foreign-backed minority within it, was negotiated by Zaev in the Albanian capital of Tirana. No one seems to be quite sure how many ethnic Albanians there exactly are in Macedonia, any more than it is known for certain how many of them reside in neighboring Kosovo. They are alleged to constitute a respectable 25 to 30 % of Macedonia’s population. But questioning that allegation or subjecting it to empirical verification is actively discouraged. As a result, the western, most densely Albanian- populated portion of Macedonia contiguous with Albania itself has now been turned into a state-within-a-state where native Macedonians enjoy a status similar to that of Indians in the US. The Albanian language has been made official alongside Macedonian and one may assume that smart and farsighted people in Skopje, who get their cues from the embassies that are running the country, are now busy taking Albanian lessons. Zaev’s second major “achievement” was to negotiate an end to the Macedonian name dispute with his Greek colleague, equally contemptuous of popular sentiment, the perfidious phony socialist Alexis Tsipras. Since Macedonia’s independence from Yugoslavia in 1992, Greece has strongly objected to the country’s name, asserting that “Macedonia” is a Greek copy-righted geographical and historical concept, that Alexander the Great was Greek not Skopje-Macedonian, and all the rest of it, typical Balkan stuff that most readers would probably find utterly boring. The name dispute, however, got hundreds of thousands of people quite excited and demonstrating vociferously on both sides of the border. It was important therefore to settle, or to at least paper over this issue to make NATO’s southern flank reasonably united in anticipation of the impending big war in the East. 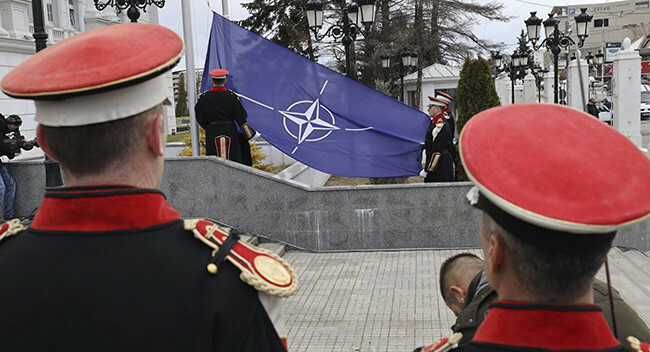 The analogy with the geopolitical situation of the Kingdom of Yugoslavia in 1941, when its politicians were cajoled into signing off on the Axis pact, and Macedonia’s today, with its accession to NATO, is striking. And yes, Macedonia was “rewarded” for changing its name not just by being generously accepted into NATO, but also with the privilege of being targeted by Russian missiles should hostilities break out in the future. Should anyone be wondering why until just a few days ago Macedonia was known by the clumsy and ridiculous acronym FYROM (Former Yugoslav Republic of Macedonia) it was because of Greece’s refusal to countenance any other label. The need to form a united front against Russia’s “malign influence” in the Balkans now clearly superseds such puerile nonsense. Orders were issued to both puppets from on high to kiss and make up, which they dutifully did, of course. Incidentally, Macedonia’s new official name of North Macedonia, which Wikipedia has already hastened to duly acknowledge, is rather underwhelming from the standpoint of idiomatic English. “Northern” would have sounded better, a detail that was not lost on the linguistically savvier Turkish partners when they were setting up their own satellite entity, the Turkish Republic of Northern Cyprus, on the part of the island that they occupy. So, the stage now seems to be set to plunge North Macedonia in a conflict its people clearly do not want, and to demolish it either by igniting ethnic warfare or making it disappear in a nuclear conflagration, whatever happens to suit global decisionmakers the best. I consulted my trusted Macedonian (I will not insult him by adding “North” to his sufficiently humiliated country’s cherished name) friend and local contact, journalist Milenko Nedelkovski, for his assessment of his country’s current situation. First things first, I asked him about the current status of his widely watched, influential, notoriously patriotic, and therefore obviously politically misaligned television talk show and whether he was getting any heat from the new “democratic and Western-values” oriented authorities. Considering that in the period preceding the degrading Zaev – Tsipras name change agreement mass demonstrations opposing it were being held throughout Macedonia, I asked Milenko why people seem suddenly to have given up in the face of the quisling fait accompli. Given the dismal conditions Milenko described, I asked him what the chances are for kicking the rascals out in the next elections. It could, of course, be said that Milenko’s remedy is worse than the disease. But this compelling cri de coeur, by a well informed and intelligent observer from the heart of the Balkan darkness that proud NATO (and who knows, perhaps soon even EU) candidate “North Macedonia” has been turned into, certainly ought not to be ignored.